Between 3-7 people is good. What is needed can be provided. Can set up at any time, take down will happen at end of set. Nope, just play whatever you want while following the principal. School starts at 7:15, and ends at 2:38. Also, portable instruments that do not need electricity are required since you will need to be moving. This is for a senior prank on my principal. I am planning on having your band follow him around all day while playing music. Arriving on the music scene in the late 19th century, Mariachi Bands brought an upbeat yet traditional sound to Mexican culture. With a blend of guitars, violins, trumpets, the guitarron, and the vihuela, Mariachi music can truly liven up a party! The upbeat authentic Mexican folk music is the perfect accompaniment for wedding receptions, Cinco de Mayo parties, and so much more. 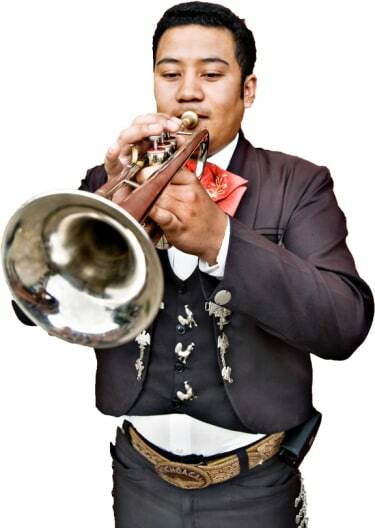 Search for Mariachi Bands in Racine, Wisconsin above. Please note that these Mariachi Bands may also travel to Sturtevant, Somers, Caledonia, Franksville, Raymond, Union Grove, Woodworth, Kansasville, Winthrop Harbor, Saint Francis, Russell, Greendale, Bristol, Paddock Lake, Hales Corners, Wind Lake, Wadsworth, Salem, Benet Lake, Camp Lake, Trevor, Silver Lake, and Antioch.